The Kunsthalle Lingen gallery presents works from the internationally famous artists Rivane Neuenschwander (born 1967 in Belo Horizonte, Brazil) and Haegue Yang (born 1971 in Seoul, Korea), who have already been represented at international exhibitions such as the Venice Biennale, Sao Paulo Biennale, and in many well-known institutions. A poetically sensuous language of form going beyond things and words characterises the artistic work of both Rivane Neuenschwander and Haegue Yang. Media-related concerns or formal matters are clearly not the starting point for either artist. In installations, objects, and video works, Rivane Neuenschwander touches on aspects of the possibility and impossibility of the phenomenon of transformation. Inspired by observations from her immediate daily life, the works fluctuate between lightness and menace, and they often sensitise us for the incidental not always perceived at first glance. For example, her installation "At a Certain Distance (Public Barriers)" was inspired by street barriers, and it is characterised by a high level of aesthetic presence. Authorship is also placed in doubt in "Anonymous Dialogues", a sequence of drawings created with typewriters by visitors to previous exhibitions; here, the letters were replaced by punctuation marks. The drawings created on the basis of writing can be read as poetical typefaces. As part of the exhibition in the Kunsthalle Lingen, the very recently created installation based on window blind installations, "Escaping Transparency", is exhibited as well as, for the first time, the mobile sculptures, "Dress Vehicles", (both 2011) made from window blinds. The installation "Escaping Transparency" swings over the heads of the viewers, and thus draws their gazes upwards. As in other installations in which blinds were used, this is about a spatial examination in which, however, the unusual positioning of the installation contradicts the usual function of blinds, which is to prevent intrusive viewing. Instead, "Escaping Transparency" is now an object for observation. At the same time, because the work is positioned beyond the reach of the visitors to the exhibition, the focus is on a part of the physical space which would not otherwise be in view from the outset. For Haegue Yang, this new configuration of positioning is a challenge, because she had to use it to part from the previously initiated exchange with the visibility and permeability of material. Only two of the blinds almost touch the floor in a gentle, tentative way. In contrast to this, the "Dress Vehicles" have significant contact with the floor, yet they have no fixed position in the room. The visitors to the exhibition can climb into the sculptures, and move around the room with them. Unlike the spatial installations of the blinds, these works are instead figurative, and their titles suggest that they have both a covering and a decorative function. In this way, the "Dress Vehicles" recall the figures of the "Triadic Ballet" by Oskar Schlemmer, which were also restricted in terms of their gestures, and which moved on the stage somewhat mechanically. "Trustworthies" is a group of paper collages by Haegue Yang, which is ongoing since 2010. The work consists of the printed insides of envelopes, and therefore has a rather simple material characteristic which permits eclectic associations because of their composition. In particular, the impression created is that of a rustic-like horizontal composition, resulting from the selection of the paper collages. The application of used envelopes makes reference to the methods of communication which the artist designates as hidden aspects of 'migration'. 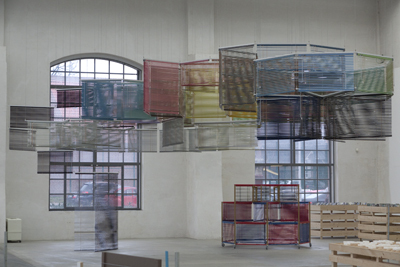 In their sensuous artistic works, Haegue Yang and Rivane Neuenschwander address aspects of transparency, of interposition, and the phenomenon of change, and in some works actively draw the viewer into them. Rivane Neuenschwander does this in the sense of transformation as a natural process, and Haegue Yang in relation to existential aspects. 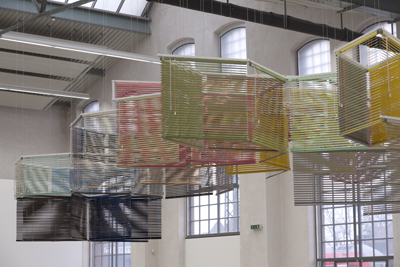 Under the title "Voice and Wind", Haegue Yang also exhibited her works in the New Museum, New York, in 2010 as well as her extensive solo exhibition "Arrivals" in the Kunsthaus Bregenz gallery in 2011. This year she was invited to Modern Art Oxford and also to the Aspen Art Museum in the USA, and presented the exhibitions "Teacher of Dance" and "The Art and Technique of Folding the Land" as well as the exhibition "The Sea Wall" with the late artist Felix Gonzalez Torres at Arnolfini, Bristol. Rivane Neuenschwander has also enjoyed solo exhibitions at the New Museum in New York and at the art gallery in the Swedish city of Malmö. The exhibition is generously supported by Volksbank Lingen and the VR foundation of the Volksbank and Raiffeisenbank banking groups in northern Germany. It could also not have been achieved without support from the state of Lower Saxony, the Emsland administrative district, the town of Lingen (Ems), and the Erdöl-Raffinerie Emsland oil refinery, as well as the Heinrich Kampmann cultural foundation.